How to make an appealing and strong Communication Plan Project Management? An easy way to start with this example Communication Plan Project Management PPT now! We provide this Communication Plan Project Management PowerPoint template to improve your presentation. Our PowerPoint templates are regularly screened and used by professionals. If time or quality is of the essence, this ready-made presentation can certainly help you out! Using this Communication Plan Project Management makes life easier. You will see that finishing a strong presentation has never been easier! 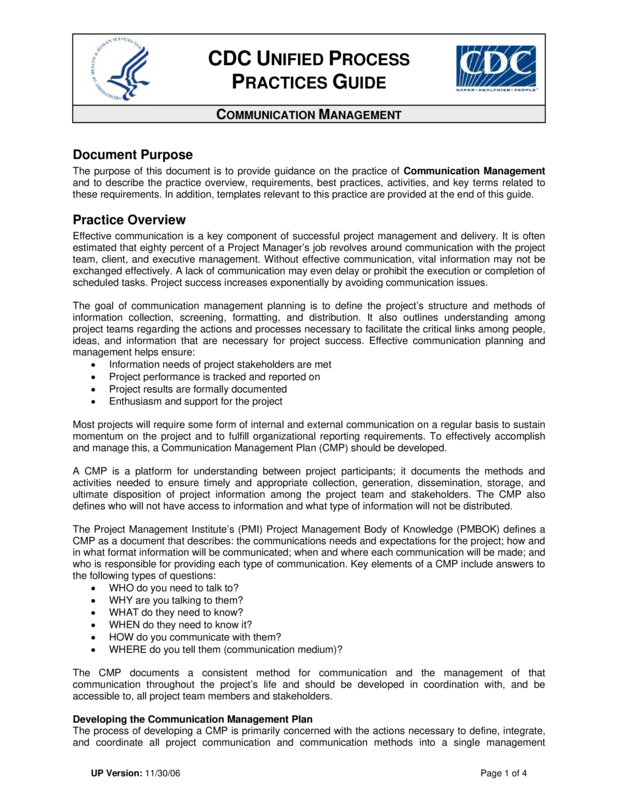 Download this Communication Plan Project Management PPT now! Best Practices The following best practices are recommended for Communication Management Plan development: • Collaborate – The CMP should be developed in collaboration with all project team members and stakeholders • Accessible – The CMP should be accessible to all project team members and stakeholders • Include – All work required for execution of the CMP should be included in the Project Plan • Work – All information in the CMP should be consistent with the Project Plan and any other related planning documents • Update – Update the Communications Plan when significant changes occur • Survey – Survey stakeholders to determine if they are getting appropriate information when it’s expected • Approve – Obtain proper approval before disseminating project information Practice Activities For software development projects the following practice activities are appropriate: • Audiences – Identify both internal and external communication audiences • Needs – Determine who needs what information, when, and in what format • Sources – Identify sources of information for developing project communications • Responsibility – Assign responsibility for collection, presentation, and dissemination of information • Distribution – Identify the best methods of distribution for each type of project communication • When – Define when communications will be distributed and by whom • Approval – Document and define the approval process, if needed, for any types of communication • Process – Develop a process for handling ad hoc request for project information • Library – Identify a location for a library of project information Practice Attributes This section provides a list of practice attributes to help project teams determine when and how development of a Communication Management Plan impacts a project..